Recognize a newspaper staff member or publisher who exemplifies community volunteerism. 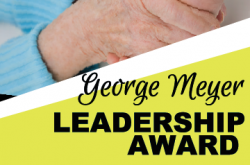 The George Meyer Leadership Award recognizes individuals who position their newspaper as a community leader, and who do their own work to strengthen their community and industry. George Meyer has graciously agreed to lend his name to the ‘George Meyer leadership award’, which recognizes a newspaper staff member or publisher who exemplifies community leadership and volunteerism. 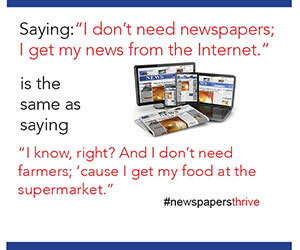 Are people like these working at your community newspaper? Samuel, a resident of Nunavut, saw hockey as a way of giving local children an opportunity to have fun and learn together. By getting local businesses to chip in with support, he was able to create a hockey league for kids in his community and provide them with new equipment. Dakota is a retired social worker who volunteers her time by sitting on the board of a small community organization that helps young people at risk. In this role, she organizes workshops in high schools and provides advice and shares best practices with employees of the organization. Deanne and other members of her community realized that several of them knew elderly men and women who were having a hard time getting to medical and other appointments. Seeing a real need in their community, the group set up a driving service to transport elderly people to their appointments. 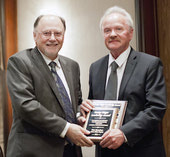 Murray Elliott of the Olds Albertan was presented with this year's award. Nominations for 2019 will be announced in the Keeping Up to Date newsletter and online. During his 50 plus year career he’s owned eight award-winning newspapers, been honoured numerous times, served as mayor, author, mentor and friend. George married Pat in 1957 and together they raised daughters Holly, Janet, and Virginia. George exemplifies quality in publishing, industry, and life. His example serves as inspiration of what we should all strive to be. 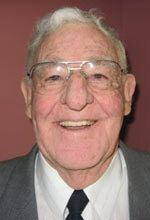 George Meyer played a vital role in shaping today’s AWNA: he served as president, CCNA director, Press Council representative, developed AWNA’s blanket classified program, operated the association’s first office from the Taber Times Office, and received Bing Crosby’s support and name for the annual AWNA golf tournament. Attach a nomination letter outline the nominee's community and industry contributions, and the work the nomineed has done to position his/her newspaper in a community leadership role.